Idaho’s deftly integrated curriculum provides a comprehensive context for participants as they develop a framework to examine the complex leadership challenges and opportunities of today’s and tomorrow’s business world. This empowering learning environment expands as each course session builds greater perspective. 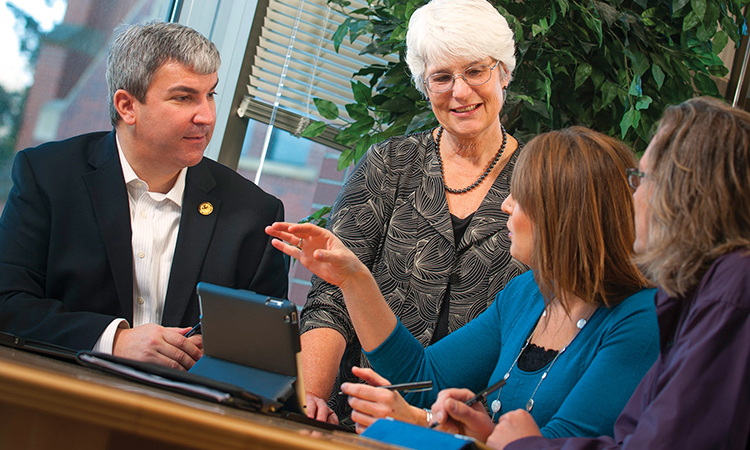 Idaho Executive MBA faculty leaders are experts at team teaching and learning. Their commitment ensures a leading edge and academically challenging learning experience for each participant. A critical component of Idaho Executive MBA education, study groups benefit participants and organizations through working collaboratively, building leadership communication and negotiation skills, bringing back current industry knowledge and actionable ideas, and applying improved problem-solving and teamwork skills. The Idaho Executive MBA Program integrates the learning experience to prepare managers to respond to the challenges and opportunities of real-world management. Using their award-winning, integrated approach to teaching and learning, faculty members examine the relevant themes of leadership, sustainability, risk, innovation, and relationship management to build a bridge between academic theory and workplace practice. The integrated program themes create a context for participants as they master the traditional functional areas of accounting, finance, management, marketing, information systems, and operations management. Idaho Executive MBA participants build comprehensive awareness of leadership, innovation, global business, decision-making and execution, and team building to prepare for the challenges and opportunities of the global marketplace. Leadership courses include team building, strategic communication, relationship management to influence behavior, change management and leadership, crisis communication, negotiation and conflict management, and management for the future. Special topics in leadership include a communication workshop that focuses on creating resilience through respect and session with a certified career coach.